Business leaders in downtown Eau Claire are offering something special to shoppers and other guests. It's a promotion that's called "First Fridays" and means that on the first Friday of each month, there are special sales, events, and even entertainment hosted by participating businesses. Businesses also stay open later. For the first Fridays in May through October, businesses can also set up outside, on the sidewalk, according to Salina Heller of Downtown Eau Claire, Inc.
About four years ago, co-owners of Tangled Up in Hue, Jamie Kyser and Erin Roesler, came up with the idea of bringing "First Fridays" to downtown Eau Claire and the event continues to happen each month. "We were actually visiting another city and saw a flyer in a coffee shop," said Kyser, on how they came up with the idea. Kyser said the idea was "to have a more cohesive downtown." The point of "First Fridays" is to offer more reasons for people to come downtown and spend time enjoying what it has to offer, while also being an "individual business thing," for the businesses that participate, according to Kyser and Roesler. Downtown Eau Claire hosts "First Fridays," which means that on the first Friday evach month, participating businesses stay open later, hold specials, sales and promotions, and even host entertainment. 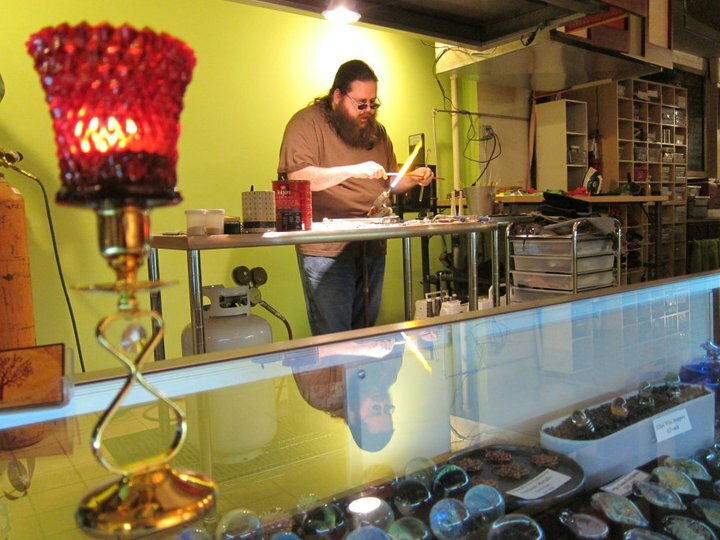 This artist gave glass blowing demonstrations at one "First Friday" at Tangled Up in Hue. Kyser says different businesses are involved each month, though Kyser and Roesler feature an artist reception and live music in their store for each "First Friday" event. Kyser said they book about six months to a year in advance for each monthly event. She said artists come to them for the most part, though if they see a local artists work around the area they like, they invite them. Heller says "First Fridays" encourages the development of social and economic activity and provides a unique opportunity for social interaction and sales opportunities. Businesses can stay open until 9 p.m.
Click here to see what's happening on this First Friday!